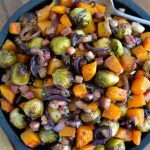 You guys….I think this recipe has officially taken top spot as my favourite winter salad. 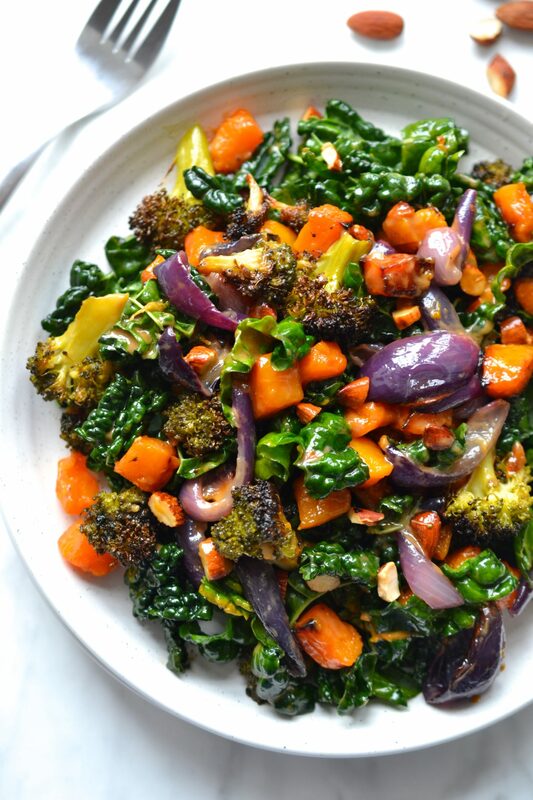 It’s a bold statement, but trust me, this salad is more than worthy. 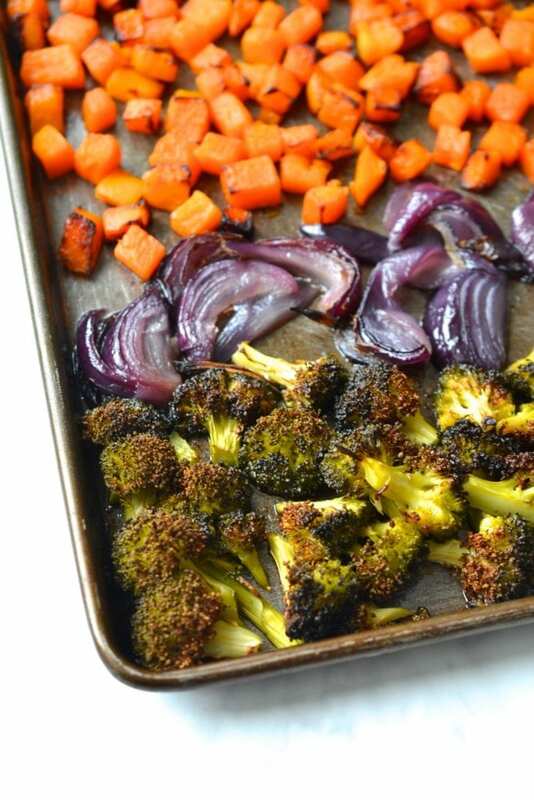 I am a total sucker for oven roasted vegetables this time of year, especially butternut squash and red onions. I love how they become slightly caramelized and so flavourful after just 20 minutes in the oven. 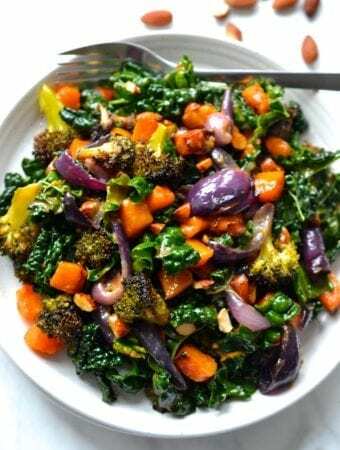 This salad is really so easy to make, just place the cubed butternut squash, broccoli, red onion and a bulb of garlic on a baking tray and roast in the oven for 20 minutes. 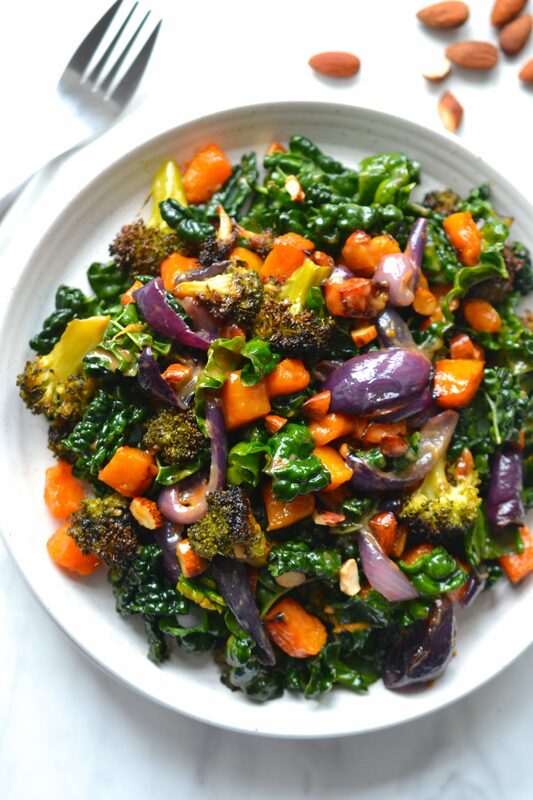 While the veggies are roasting you can prep the rest of the salad by shredding the kale and massaging it for a minute or two. I know that massaging kale sounds excessive, but it really makes such a big difference tenderizing the leaves. The dressing is so simple! 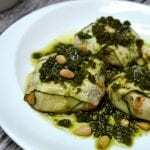 The roasted garlic makes it slightly creamy and gives the dressing a deliciously rich flavour. 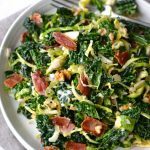 I like to add in an egg yolk to make the dressing even creamier, but if you are Vegan or prefer not to eat raw egg then you can easily leave it out, it won’t make a massive difference. I am also really happy with how well this salad lasts. The day 2 leftovers were absolutely delicious and in no way soggy or limp. Preheat the oven to 220 degrees Celsius (425F). 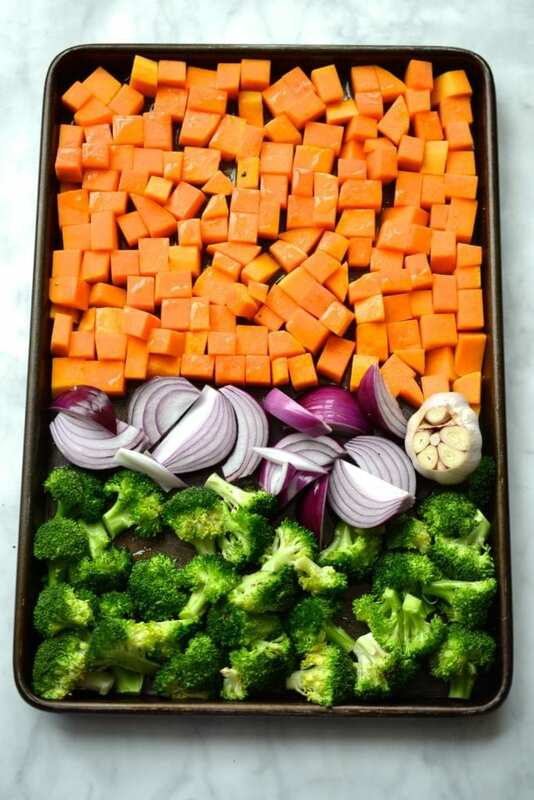 Place the cubed butternut squash, broccoli florets and red onion on a baking tray. Cut the top off of the garlic bulb and place it on the baking tray. 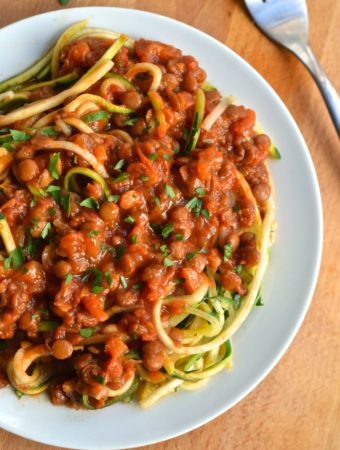 Drizzle everything with 1 1/2tbsp olive oil and sprinkle with 1/2 tsp salt. 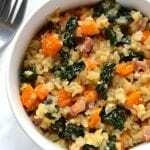 Place in the oven to bake for 20 minutes until the butternut squash is tender. 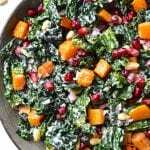 To prep the kale, remove the stems and chop the leaves into bite sized pieces. 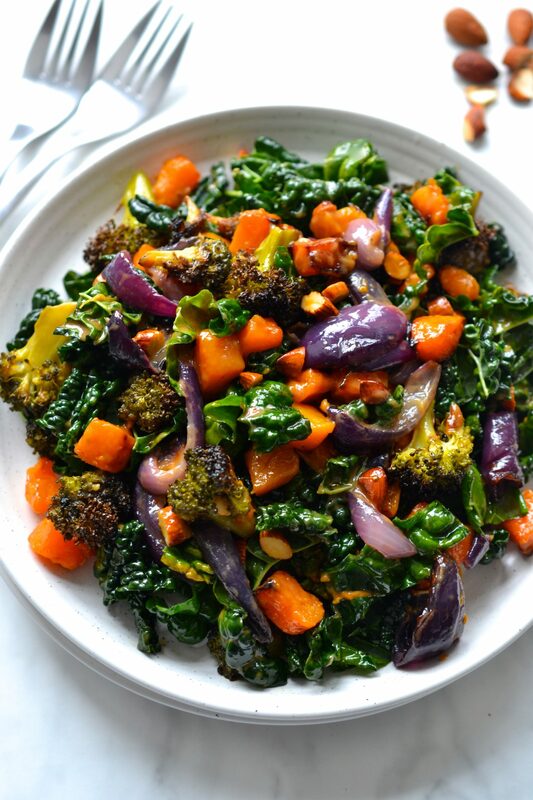 Place the chopped kale in a large salad bowl and sprinkle the leaves with a pinch of salt. With clean hands massage the kale leaves by scrunching it between your hands for about 1 minute. The kale will become darker in colour when you do this. Squeeze the cloves out of the roasted head of garlic and place them in a blender or nutribullet. Add in the olive oil, balsamic, pepper and optional egg yolk. Blend until smooth and creamy. 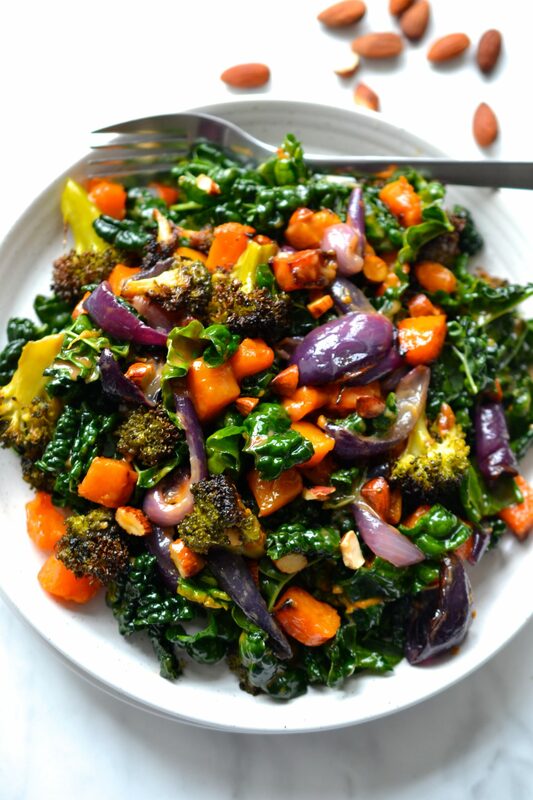 To assemble the salad place the shredded kale in a bowl, top with the roasted butternut squash, broccoli and red onion, top with the chopped almonds and toss with the dressing. 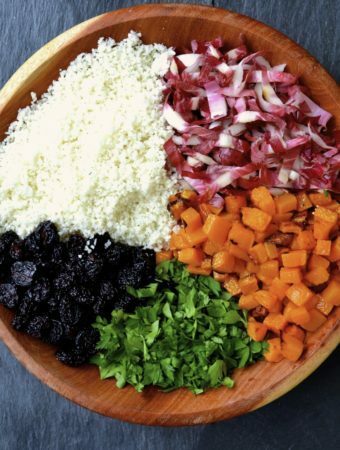 Love this salad. Making it again this weekend. I just made this salad and it was absolutely delicious.😋 I was out of a few of the ingredients but made substitutions. Instead of butternut squash I roasted sweet potatoes and my substitute for almonds were walnuts. My husband absolutely loved it. Thank you for sharing! 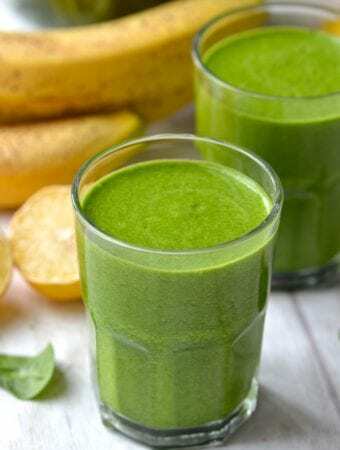 My belly says yes but my blender said no. The garlic bulbs kept escaping the blades until I eventually gave up and chopped the garlic. 😂 It tastes delicious though! haha the garlic should be more of a paste when they come out of the oven that you can easily mash with a fork. Happy to hear it still tasted ok! 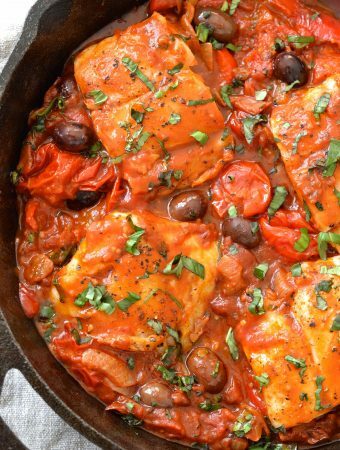 Great to hear that it turned out well with the sherry vinegar!So happy you enjoyed it! 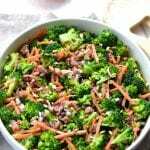 I loved this salad, it was a great combination of flavors.As a short cut to massaging the kale I read(and have since used) to use electric mixer at lowest speed mix with paddle. It works beautifully and is very fast. 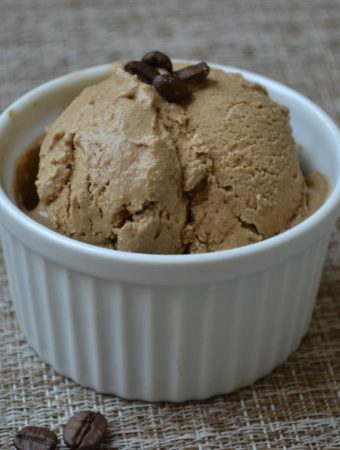 I have never heard of the electric mixer technique but that is absolutely genius! I will definitely have to give it a try!